Zebpay, a leading Bitcoin exchange in India that is headquartered in Singapore and has an office in India, has scammed our Chief Editor, Abhishek Bhatnagar, out of a huge sum of Rs. 1,00,000. This post is to highlight how the fraud took place, and to remind you about it when you wish to use Zebpay or other similar services in the future. Frauds while purchasing products and services can happen with anyone, and on many occasions, people either lack the motivation to talk about it and raise a complaint, or simply don’t know how to. With this post, we hope we can spread awareness about Zebpay’s scam. Bitcoin and other cryptocurrencies are in the news these days, and as such, our Chief Editor wanted to make an investment in Bitcoin. For this, he chose Zebpay and added Zebpay’s account details in his Citibank account for an electronic transfer of funds. Once that was done, our Chief Editor went ahead and transferred Rs. 1,00,000 to Zebpay on 16/01/2017 – fund transfers are generally reflected in Zebpay account of the user in 1 or 2 days, upon which the user can purchase Bitcoin or any other supported cryptocurrency. Unfortunately, the fund transfer did not reflect into our Chief Editor’s Zebpay account. 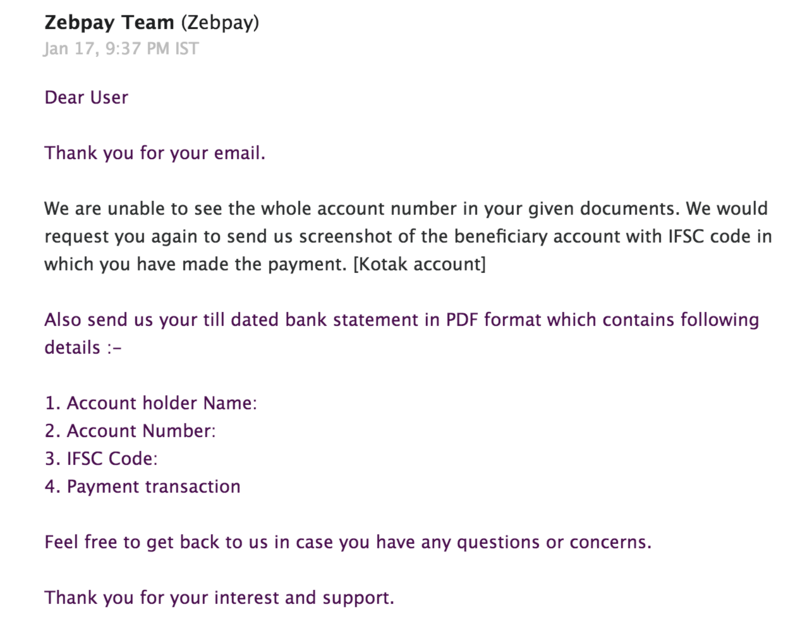 So, after waiting until 17th January, he initiated a support request after looking up Zebpay Support’s email address on the company’s website – it is to be noted that they do not have any support option in their mobile app. Upon receiving the request, Zebpay reverted with a response asking our Chief Editor to submit a screenshot of the transaction, the bank statement that shows the payment details. As such, our Chief Editor promptly sent the requested details on the same day. Since then, up to January 25th, it’s been almost 10 days and there are still no signs of the funds that have been transferred to Zebpay – the customer support team had responded that either the funds will be refunded or they will be added to the Zebpay user account. Neither of the two possible solutions have been reached at, yet. 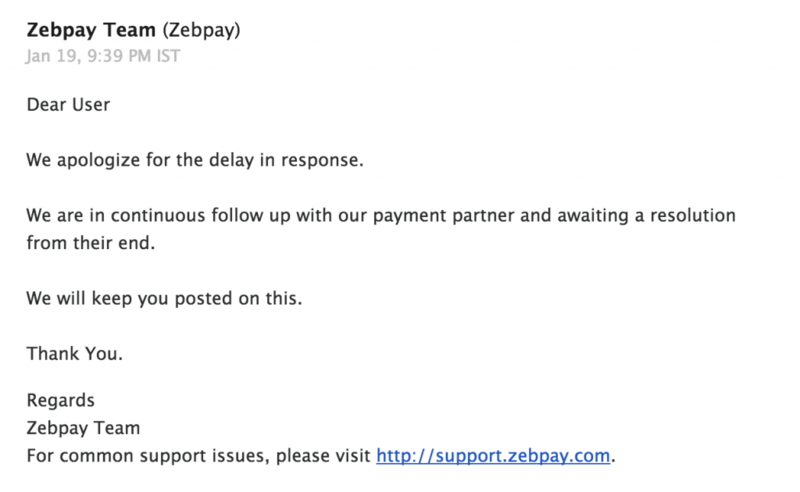 According to the latest response from Zebpay, they say they are unable to process the refund. According to them, the payment was done via a payment portal called Razorpay, and the funds were sent to Zebpay’s Kotak Mahindra Bank account. 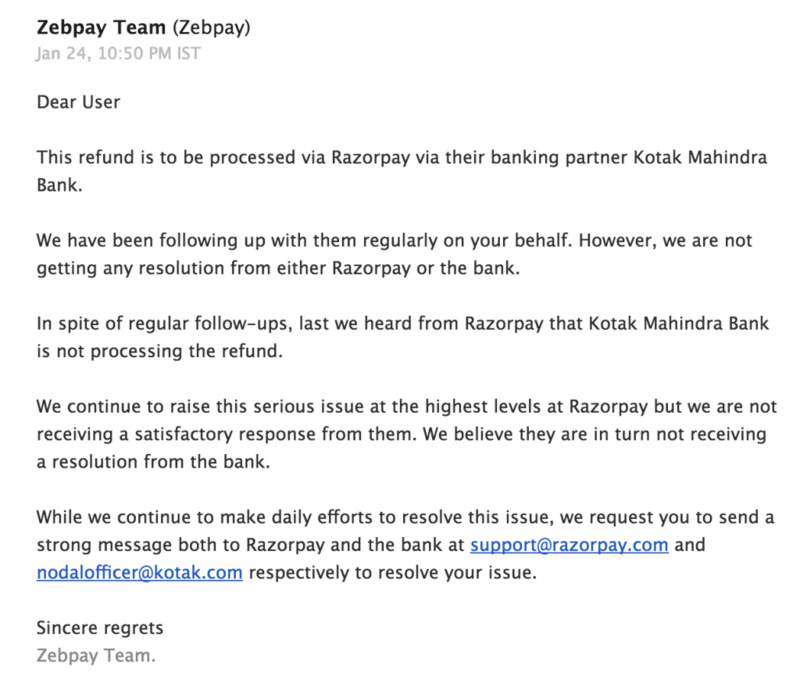 Zebpay says that the transaction is not being processed from Kotak Mahindra Bank’s end, and for this to happen, Razorpay needs to process it. At this point, our Chief Editor is not sure what will happen with his money. The funds were transferred to the Zebpay bank account that was shown in the app, and as such, it becomes Zebpay’s responsibility to sort out any issues that arise due to this. However, it would seem like Zebpay has scammed him out of his money. We hope with this post we have been able to spread some awareness about the risks involved in online transactions, especially with those services that are associated with Bitcoin and other cryptocurrencies.